Hiring? Toptal handpicks top M&A consultants to suit your needs. David specializes in managing complex/unique projects for C-Suite executives at Fortune 500 companies. He has managed transactions > $1.5Bn. Professional sports franchises comprise a distinct market where teams typically sell at prices in excess of what would be expected based on traditional valuation methodologies. Traditional fundamental variables (e.g., profitability or cash flows) do not tend to impact the valuation of professional sports teams as they would other businesses. The valuation of a professional sports franchise is primarily driven by supply and demand forces. There is a limited supply of teams and a growing number of billionaires (potential buyers) that continue to bid acquisition prices higher as teams become available for sale. There are 123 total professional sports teams in the US and the number of billionaires increased by 13% to 2,043 in 2017. How Are Professional Sports Franchises Valued? Owners of sports franchises often do not view the sports team as an asset to provide a return from year to year but instead expect to realize their return via the sale of the franchise at some point in the future. The precedent transaction approach is most commonly applied in the valuation of a professional sports franchise with revenue serving as the valuation metric. The application of this approach allows the analyst to observe expectations of buyers through actual prices paid for similar assets and best captures the perceived "ego" or "trophy" value of professional sports teams. Step 1: Multiple Selection. A multiple range of 5.5 to 6 times revenue was selected upon consideration of the comparability of the acquired teams in the precedent transactions to the Trail Blazers, and necessary adjustments to the implied multiples for each precedent transaction were made. Step 2: Adjusted Trail Blazers Revenue. The Trail Blazers' 2016-17 season revenue of $223 million. However, an additional $12 million was anticipated for the local television extension known to start for the 2017-18 season. Therefore, the adjusted Trail Blazers' revenue to use in the valuation is $235 million. Step 3: Application Revenue Multiples. Applying revenue multiples of 5.5 and 6 times the adjusted Trail Blazers' 2016-17 season revenue of $235 million results in an estimated value range of approximately $1.3 billion to $1.4 billion. Given the unique nature of the professional sports industry, an expert's prior experience with professional sports team valuations should be considered by the client. The primary reason for a valuation of a professional sports franchise involves the sale or purchase of a team. Additionally, sports teams tend to be owned by individuals with gift and estate tax planning needs that require valuation work. Some additional reasons might include: business reorganizations, shareholder disputes, shareholder agreement structuring, insolvency, commercial litigation, and marital disputes. When we hear about the business side of sports, we often see headlines about large year-over-year increases in reported Forbes’ team valuations, huge new national television contracts, astronomical team sale prices, record free agent player contracts, and oftentimes annual financial losses for teams. The most recent professional sports franchise ownership change resulted in the second highest purchase price in MLB history for a team that generated operating losses in three of the past five seasons. In September 2017, MLB approved the sale of the Miami Marlins to an ownership group led by Bruce Sherman, which includes Derek Jeter. The ownership group reportedly agreed to purchase the team for approximately $1.2 billion. The reported price paid for the Marlins was the second highest purchase price in MLB history, behind only the $2 billion acquisition of the LA Dodgers in 2012. The following chart shows the Marlins’ financial performance for the five seasons prior to the sale of the team. This article will discuss reasons why a business that, per Forbes, had an operating loss of $2.2 million during the previous season on $206.0 million in revenue could sell at such a high price and what approach should be applied in estimating the value of a professional sports team. Forbes estimates team values for each league annually based on a proprietary methodology. Despite not going to the Super Bowl in 20 years, the Dallas Cowboys remain the most valuable sports franchise. Why? While it’s surely a combination of factors, the Cowboys have been pioneers in creative sponsorship deals, leading to revenue of over $150 million annually (over three times the league average sponsorship revenue last season). Also, the Cowboys are the only team in the NFL that retains all of its merchandise sales (the remaining 31 teams share equally in their merchandise sales), which combined with the team’s popularity contributes to thriving team merchandise sales. The table below shows the ten highest valued sports franchises in the US (in millions) based on the latest released team valuations for the major leagues. First, we will begin with a discussion about the economics of the four major US sports leagues followed by unique valuation considerations for a sports team, general valuation methodologies and application to a sports team, and finally a hypothetical valuation analysis of the Portland Trail Blazers. The article highlights and applies knowledge I have compiled from performing professional sports franchise valuations in the NFL, MLB, NBA, and NHL. These sports team valuations were prepared for the purposes of gift and estate tax, litigation, internal planning, and purchase price allocation. While the goal of profit maximization is consistent with any business, the sources of revenue for professional sports teams and operating expenses are unique versus other industries. Certain financial information is reported in the press, mainly Forbes’ annual team valuations; however, the accuracy of this information is unknown and is sometimes disputed by the teams. However, detailed audited financial statements for the teams are not available as all of the teams are private companies. Based on my experience (consistent with previously reported information), media revenue and gate receipts comprise a majority of total revenue with sponsorship, merchandise, and other making up the balance across the leagues. Operating expenses for the major sports leagues are dominated by player salary expense, which can vary greatly from season to season and have a large impact on profitability (or lack thereof). Each league has some form of revenue sharing among the teams; however, the specifics on what sources, and what portion of those sources, are shared differ between the leagues. “Live sports is the most valuable content on the planet,” according to Adam Ware, head of digital media at Tennis Channel, based in Santa Monica. As such, media rights revenue for professional sports programming has continued to dramatically increase with each new agreement. Sports media rights fees continue to grow because sports fans tend to watch televised events live and are typically younger (the desired target advertising demographic), which allows television networks to charge a premium for commercial airtime relative to other content. The primary sources of media revenue are national and local television contracts, with national and local radio, league-owned sports networks, and digital media also providing media revenue. Each of the big four major leagues has national television agreements, which deliver significant annual revenue to the teams as shown in the table below. The current national television agreements are long-term in nature, providing a significant stable source of revenue for the foreseeable future. Each of the major sports leagues share the national television revenue equally amongst the teams. For MLB, NBA, and NHL teams, local television revenue has become increasingly important as recent agreements have delivered a significant annual revenue source for some teams. Only preseason games are covered by local television contracts in the NFL. In the NBA, the Lakers and Knicks received more than $100 million in local media revenue last season. Only four teams in the league received local media revenue within $100 million of the Lakers. This disparity can have a large impact on a team’s ability to spend on players and profitability. In recent years, alternative media companies, including Amazon, Facebook, YouTube, Twitter, and others, have obtained non-exclusive rights to different packages of live professional sports games to carry on their platforms. The fees from these technology companies are expected to increase in the coming years for similar, or possibly expanded, rights. It is expected that alternative media companies could get involved with the bidding for the media rights traditionally held by the major television networks as those agreements expire. If alternative media companies became involved in the bidding for media rights upon expiration of the current contracts, the leagues could see record increases in media revenue in the next deals. National and local radio agreements are an additional revenue source for each league, but substantially less than the national and local television rights. Team gate receipt revenue is a function of ticket prices and attendance. Ticket prices vary from team to team based on local market demographics. Attendance is largely dependent on team performance, but some markets can sustain high attendance with inferior team performance. The table below shows the gate revenue for each league for the latest season reported by Forbes. Corporate sponsorship revenue is derived from both the league level and the team level. As an example of local sponsorship revenue, the NBA allows teams to wear jerseys with 2.5 by 2.5-inch ads above the left breast. Nine NBA teams have signed agreements, including the Cleveland Cavaliers who will receive more than $10.0 million from Akron, Ohio-based Goodyear. 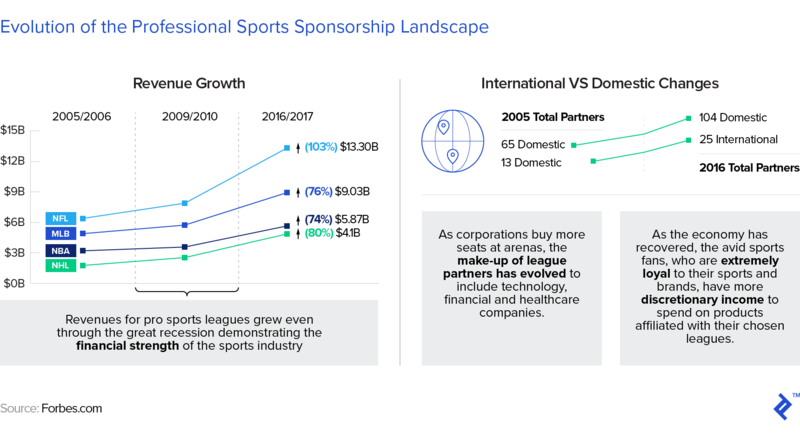 Sponsorship revenue has shown tremendous growth for the big four sports leagues even through the Great Recession. The leagues also receive revenue through sales of team merchandise, which includes jerseys, hats, and other team branded products. Finally, most teams receive stadium-related revenue, which includes naming rights, in-stadium signage/advertising, luxury suites, parking, and concessions. The portion of these revenue streams that each team receives is dependent on the ownership or lease terms for the stadium. In summary, the table below shows the total revenue for each league for the latest season. The primary expense item for all of the sports leagues is player expense. The teams of each league are subject to either salary caps or luxury tax penalties that impact player spending either directly through a hard cap or indirectly through economic penalties (e.g., luxury tax payments) for teams that exceed predetermined thresholds. As the table below shows, the range of player expense as a percent of total revenue was approximately 44% to 51% for the latest season report by Forbes for each league. Additional expenses for professional sports franchises include: team (excluding player salary and benefits), marketing and public and community relations, finance and administrative, and stadium-related expenses. An estimate of league operating profitability is reported annually by Forbes, which is defined as earnings before interest, taxes, depreciation, and amortization (EBITDA). Further, Forbes states that “revenue and operating income are for [the] 2016-17 season [or latest available] and net of revenue sharing and arena debt service.” As shown in the table below, the NFL is the most profitable of the Big Four sports leagues based on the latest reported season. The valuation of professional sports franchises requires consideration of several unique factors that do not exist in most traditional business valuations. Professional sports franchises comprise a distinct market where teams typically sell at prices in excess of what would be expected based on traditional valuation methodologies. A significant reason for this is the limited number of teams available (123 total professional sports teams in the US) and the growing number of billionaires (increased by 13% to 2,043 in 2017). Given the limited number of available assets and growing number of potential buyers, when a team becomes available for sale, the competition among potential buyers typically results in purchase prices in excess of what might seem rational based on the underlying economics of the business. 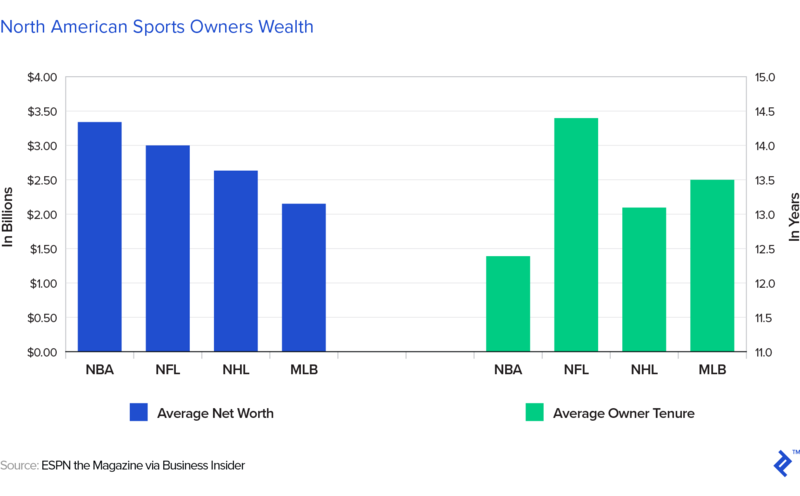 Buyers of sports franchises are typically wealthy individuals for whom the attraction of ownership is based on its perceived “ego” or “trophy” value, as other individuals might purchase a new sports car. Typically, the buyer of a business considers the expected future cash flows in determining the value of the target business. However, owners of sports franchises often do not receive a return in the form of cash distributions on the investment from year-to-year, but instead expect to realize their return via the sale of the franchise at some point in the future. Professional sports team owners have accumulated vast wealth from businesses prior to acquiring their teams (see chart below), which can allow them to operate the teams unprofitably for many seasons. Work stoppages can have both an immediate and a long-term impact on the financial health of sports leagues and the teams as stadiums sit empty and fans find other ways to spend their time and money. While the 1994 strike in MLB was the longest work stoppage in US professional sports, an NHL lockout in 2004 resulted in the cancellation of the entire 2004-05 season. An argument could be made that a team might command a higher valuation due to the presence of a “marquee” player on the roster. This would likely be reflected through higher team revenue from gate receipts and possibly local media revenue (if an agreement is being renegotiated as ratings increase). For example, LeBron James returned to the Cavaliers for the 2014-15 season. The team was ranked 16th in home attendance in 2013-14 but increased to 2nd during his return season and remained 2nd through the 2016-17 season. Correspondingly, gate receipts increased to $52 million (2014-15) from $29 million (2013-14), or 79.3%. Further, as noted in the discussion of revenue, local market factors (population, median income, fan loyalty, etc.) all have impact on the potential revenue a team can achieve within its home market. This can impact the price a buyer is willing to pay as relocation, while possible, can be expensive and requires league approval. The income approach, via the discounted cash flow method, where the value is estimated based on the cash flows a business can expect to generate over its remaining useful life. The market approach, via the comparable companies method and the precedent transaction method, where the value is estimated based on exchange prices in actual transactions and on asking prices for assets currently offered for sale. The asset-based approach, where the value is the estimated net asset value of the business (fair market value of the assets minus the liabilities). Given that there is a reasonably active market for professional sports team transactions in each league, the precedent transaction approach is most commonly applied in the valuation of a professional sports franchise. The application of this approach allows the analyst to observe expectations of buyers through actual prices paid for similar assets and best captures the perceived “ego” or “trophy” value. As profitability can be minimal or nonexistent for professional sports teams, a revenue multiple is typically applied in the valuation analysis. Consideration is given to the facts and circumstances of each transaction and will have an impact on the selected multiple for the subject team. The largest factors typically include CBAs and media contracts at the time of the transaction, both the economics of recently signed agreements or expectations for new agreements upon expiration. As an example, I will estimate the hypothetical value of the Portland Trail Blazers through the application of the precedent transaction method. To estimate the value of the Trail Blazers, this section will first review the NBA economic environment, recent NBA team sales, and background on the Trail Blazers. Note that this hypothetical valuation example utilizes only financial information that could be obtained publicly, which may not reflect the actual financial performance of the teams. Understanding the current economic environment helps to provide a context to evaluate recent transactions and expectations for a current valuation. As previously noted, the largest factors impacting league economics include CBAs and media contracts. The NBA has experienced labor peace since the 161-day lockout in 2011, which ultimately resulted in a 10-year CBA. The 2011 CBA had a mutual opt-out (a shared opt-out between the NBA and the players’ union) in 2017, but the sides agreed to terms for a new CBA before the opt-out date resulting in the current CBA signed in July 2017. Many of the key terms remain unchanged from the 2011 CBA. Therefore, in considering appropriate transactions to review for a current team valuation, the date that the 2011 CBA was signed draws the line for current team economic expectations as it relates to player expenses, salary cap, luxury tax, and revenue sharing. As part of the current CBA, the players receive 49 to 51% of basketball related income (BRI) for the remaining seasons, which is down from 57% of BRI in the 2005 CBA. Revenue sharing tripled from the 2005 CBA, which benefits small market teams. The 2005 CBA set the minimum team salary at 75% of the salary cap, which increases to 90% of the salary cap for the remaining seasons of the current CBA. The luxury tax is more punitive under than the 2005 CBA, where teams paid $1.00 for every $1.00 that team salary was above the luxury tax threshold. However, now each team will pay $1.50 for every $1.00 above the luxury tax threshold up to $4,999,999. Further, these tax payments are incremental and increase for every additional $5 million above the luxury tax threshold to payments per excess dollar of: $1.75, $2.50, $3.25, etc. Teams that pay the luxury tax at least four out of the past five seasons have a tax that is $1.00 higher at each increment ($2.50, $2.75, $3.50, $4.25, etc.). The latest national television contract between the NBA and ESPN/TNT, announced in October 2014 commencing with the 2016-17 season, provides the teams with $2.6 billion annually through the 2024-25 season. The current national television contract increased the annual revenue by approximately 180% over the previous contract. Given that the contract was announced in October 2014, it is not unreasonable to assume that expectations for the new television contract would have impacted transactions closed in 2014, as these agreements take many months to negotiate and owners are kept updated on negotiation status. While this substantially increased revenue to the team owners, it should be noted that national television revenue is a component of BRI and increases player spending through the CBA. To best capture the economic expectations of a potential buyer of an NBA franchise today, only transactions that closed with the 2011 CBA and the latest national television contract in place will be considered in the hypothetical valuation analysis. I have made adjustments to the reported revenue if expectations would have been different at the time of the negotiations. The four sales of NBA franchises from 2014 through 2017 were: the Houston Rockets, Atlanta Hawks, Los Angeles Clippers, and Milwaukee Bucks. In September 2017, Houston billionaire Tilman Fertitta successfully outbid a number of potential buyers to acquire the Houston Rockets for a reported $2.2 billion. The transaction implied a revenue multiple of 7.4 times the 2016-17 season revenue of $296 million, as reported by Forbes. The Rockets operate in the fourth largest city in the US, giving them a sizable market of 6.2 million people with a 2016 median household income of $60,902. Houston ranked 21st in home attendance, but 7th in gate receipts for the prior season. The Rockets and Houston Astros share annual local television revenue of approximately $107 million; the split of this revenue between the teams is not publicly available. However, assuming the revenue is split pro-rata based on the number of games per season, the Rockets receive approximately $36 million. The team reportedly receives annual naming rights revenue of $4.75 million from Toyota through 2023. Billionaire Tony Ressler, who unsuccessfully bid on the Clippers in 2014, acquired the Atlanta Hawks for a reported $730 million in April 2015. The transaction implied a revenue multiple of 5.1 times the 2014-15 season revenue of $142 million, as reported by Forbes. The Hawks ranked 17th in home attendance and 20th in gate receipts for the 2014-15 season. Atlanta is the 11th largest market in the NBA with a population of 5.7 million people and a 2016 median household income of $59,183. The team has operating rights to the Phillips Arena, which was built in 1999. Royal Philips Electronics N.V. of the Netherlands pays an annual naming rights fee of $9.25 million until 2019. While being marketed for sale, it was reported that the team was negotiating a new local television contract, which was expected to increase average annual revenue from $12 million to more than $30 million. Adjusting the 2014-15 revenue for the local television contract, expectations would increase the expected revenue to $160 million and imply a revenue multiple of 4.6 times. Following legal proceedings involving Donald Sterling, the previous owner, Steve Ballmer acquired the Los Angeles Clippers for a reported $2 billion in August 2014. The transaction implied a revenue multiple of 13.7 times the 2013-14 season revenue of $146 million, as reported by Forbes. The Clippers ranked 7th in home attendance and 11th in gate receipts for the 2013-14 season. The Clippers, with the Lakers, share the 3rd largest market in the NBA with a population of 13.1 million people and a 2016 median household income of $62,216. The team, along with the Lakers, has an operating lease for the Staples Center and share a perpetual naming rights agreement with Staples, Inc. that pays $5.8 million annually. The sale of the Clippers came during a period where both the national and local television contracts were coming up for renewal. The expectation was that the national television contract would at least double from $930 million annually. The local television contract was expected to increase from an average annual amount of $20 million to as much as $75 million. Adjusting the 2013-14 revenue for the television contract expectations would increase the expected revenue to $232 million and imply a revenue multiple of 8.6 times. In April 2014, hedge fund managers Wesley Edens and Marc Lasry acquired the Milwaukee Bucks for a reported $550 million. The transaction implied a revenue multiple of 5 times the 2013-14 season revenue of $110 million, as reported by Forbes. The Bucks ranked 30th in home attendance but were 11th in gate receipts for the 2013-14 season. Milwaukee is the 26th largest market in the NBA with a population of 1.6 million and a 2016 median household income of $55,625. Under the arena lease agreement in place at acquisition, the team did not pay rent, but reportedly received only a small portion of suite, merchandise, and concession revenues. The Bradley Center was opened in 1988 and is among the oldest in the league, but the new owners anticipated a new arena being built that should improve the team economics. The expectations regarding the next national television contract were consistent with those at the time of the Clippers’ acquisition. 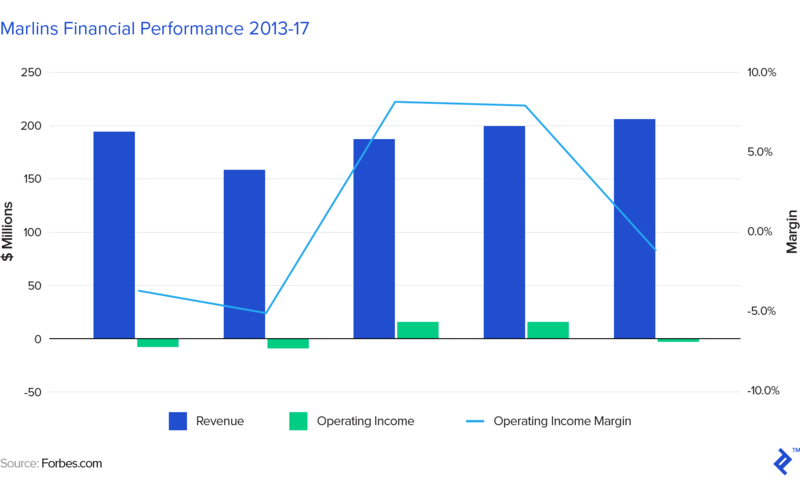 Additionally, as a small market team, the Bucks would have expected improved profitability from increasing revenue sharing. Adjusting the 2013-14 revenue for the national television contract expectations would increase the expected revenue to $141 million and imply a revenue multiple of 3.9 times. Paul Allen acquired the Trail Blazers for approximately $70 million in 1998. Since he acquired the team, the Trail Blazers have posted a 0.561 regular season winning percentage and have been in the playoffs 22 times. In an effort to reduce a potential $40 million luxury tax payment during the 2016-17 season, the team traded Allen Crabbe, and his $19.3 million salary, to the Nets. The Trail Blazers had the sixth highest player expense in the NBA which, given the team’s revenue, cannot be supported without operating at a loss. The Trail Blazers ranked 9th in home attendance and 16th in gate receipts for the 2016-17 season. Portland is the 21st largest market in the NBA with a population of 2.1 million people and a 2016 median household income of $62,772. The team plays in the Moda Center, which was constructed in 1995 but recently renovated. These upgrades likely improved revenue from luxury suite/club seats, concessions, and stadium advertising. The Trail Blazers signed a four-year extension with Comcast SportsNet Northwest that will begin with the 2017-18 season and run through 2020-21. Financial terms were not disclosed, but the prior agreement paid the team $12 million per season. The Cavaliers signed a local television deal that reportedly pays the team between $35 and $38 million per year, extends through the 2020-21 season, and plays in a comparably sized market. Given this, it’s not unreasonable to assume that the Trail Blazers local television revenue at least doubled from the prior agreement. In 2013, Moda Health paid $40 million for a ten year naming rights agreement. Based on population, Portland is most comparable to the Bucks, but based on median household income, it ranks consistent with Los Angeles. The Trail Blazers rank 3rd based on total revenue for the 2016-17 season. While profitability is not explicitly considered through projected cash flow in the precedent transaction approach, it should be considered in the revenue multiple selection process. As previously noted, the Trail Blazers have the sixth highest player expense in the league. The higher player expense is not only direct in salary cost but also the penalties paid through the luxury tax system. As a result, the team reported an operating margin of approximately 9% less than the average league margin. Over the next few seasons, it is not unreasonable to expect that profitability for the Trail Blazers will regress to the average league profitability of approximately 20% as player contracts expire and player expense reduces, which also approximates the average profitability of the Rockets and Hawks. Based on consideration of the metrics for each of the precedent transactions relative to the Trail Blazers, I selected a multiple range of 5.5 to 6 times revenue (the average of the Rockets, Hawks, and Bucks, and the Rockets and Hawks). The Clippers implied multiple is excluded as it appears to be an outlier likely due to local market size, even after making adjustments for revenue expectations. Applying revenue multiples of 5.5 and 6 times the Trail Blazers’ 2016-17 season revenue of $223 million, with an additional $12 million for the local television extension known to start for the 2017-18 season, results in an estimated value range of approximately $1.3 billion to $1.4 billion. As noted in this article, the most commonly applied valuation method is the precedent transaction method, and consideration must be given to the facts and circumstances of each precedent transaction in selecting a multiple for the subject team. While the article focused on the most common valuation method for a professional sports team, depending on the league’s salary cap/revenue sharing mandates and team’s local market factors, positive cash flow may be consistently achieved and an income approach could also be applied in a valuation analysis. However, the value of professional sports franchises will continue to depend on the willingness and availability of individuals wealthy enough to pay a significant multiple of revenue to own these “trophy” assets. How profitable is the NFL? According to the latest Forbes annual team valuation, the NFL’s aggregate team operating profit (defined as EBITDA) was approximately $3.2 billion. This translates to an operating profit margin of 24.7% on total revenue of $13.2 billion. How much does the NBA generate in revenue? According to the latest Forbes annual team valuation, NBA teams collectively generated revenue of $7.4 billion last season. This was an increase of 25% from the prior season revenue. How much money does the MLB make a year? According to the latest Forbes annual team valuation, the 30 MLB teams earned an aggregate operating profit (defined as EBITDA) of approximately $1.0 billion on total revenue of approximately $9.0 billion. What does the CBA mean in the NFL? The 2011 collective bargaining agreement (CBA) between the NFL owners and the players' association extends through the 2020 season. The CBA provides relative cost certainty for owners as it relates to the split of league revenue between owners and players, minimum player salaries, player benefits, and pension. At Duff & Phelps, David has managed valuation engagements involving transactions greater than $1.5 billion for publicly traded companies in the industrial products and chemicals industries. He has extensive experience working with the senior management of Fortune 500 companies in various industries. Freelancing allows him to leverage his skills and experience to assist clients with complex and unique projects.